Is This Proof Facebook is Targeting You With Ads Via Your Computer’s Camera? An American woman has set the Twittersphere alight after she was served a Facebook ad for the exact same outfit she was wearing at the time. 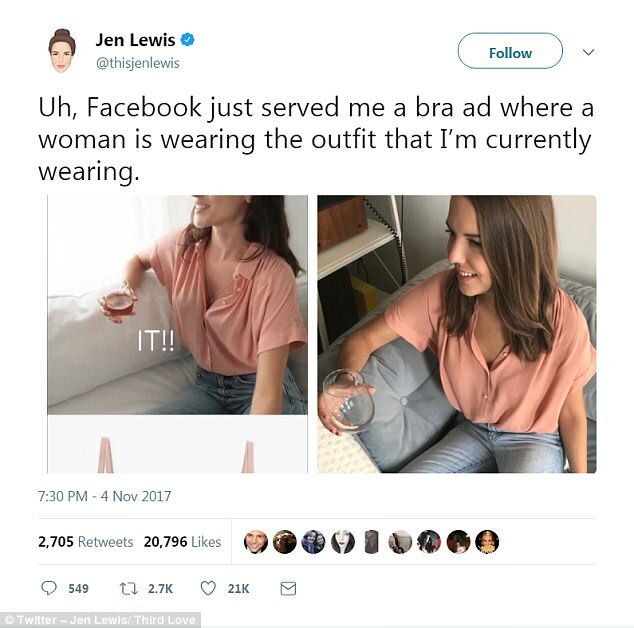 The woman, Jen Lewis from New York, claims the incident was all just a coincidence, however, others are suggesting it’s proof that Facebook is watching you via your smartphone’s or computer’s camera. According to reports on the Daily Mail, Lewis was wearing blue jeans and an apricot-coloured blouse when she was served a bra ad featuring a model in the exact same outfit she was wearing at the time. Lewis even recreated the ad for Twitter. Lewis’ tweeted garnered hundreds of responses with many speculating it was more proof that the social media behemoth targeted users via image recognition software. Facebook has continually denied any claims it spies on its users, despite having been busted trying to develop and patent the software to do so. However, others were less suspicious believing Facebook didn’t have that sort of targeting technology and it was all merely a coincidence. “As someone who advertises on Facebook… this is a coincidence. You can’t target based on anything like that,” said another.